As often happens this time of year, I have been MIA for a while. This is a normal travel time for me, and the weekend days I spend “curating” images, posting to websites, and writing blogs are take with travel and often little time to reflect and write. But it recharges my proverbial batteries and I usually come back with some material to post and write here. And so, it will be for the next couple weeks. I took a 4 day trip to the San Francisco Bay area with a number of photographic opportunities. I have made a couple trips to Northern Michigan to seek and shoot Fall foliage and will have a few images and comments there. And I have finally had some time behind some of my new gear, and will devote a blog or two to review of the Sony a7R and Sony 70-200 f4 combo and a set of tripod legs from Sirui. I always look forward to late September with some excitement. No matter what kind of a shooting year I have had up until that time, I know I will have some opportunity for serious photographic endeavor during the next 2-3 weeks. As my blog has illustrated, I always have some kind of travel/photography planned for this time of year, more often than not, a fall-foliage oriented destination like New England, West Virginia, the Michigan Upper Peninsula (the UP), or the West. But not every year. This year, as in 2011, I traveled to California. 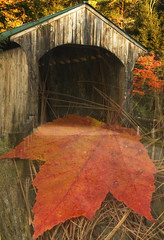 With its consistent, temperate climate, there is no fall foliage there. But there are nice things to shoot, so that is a consolation. Even in those years when I travel elsewhere, I try to find some fall foliage imagery wherever I can. This year, I will have just a couple of weekend days to photograph. Knowing that, on Columbus Day weekend, I headed north from Saginaw early on a Sunday morning, with my best friend, and photographic buddy, Rich, in search of some foliage-oriented subjects. We did not have a plan, just a general area, in which neither of us had ever done any photography. We shot what we found. Our first subject was in Gladwin, Michigan, a small berg, just a few miles north of Saginaw. Here, we found a nice red barn with a cluster of red out buildings, backed by some early fall foliage. Since Mid-Michigan is not really known for its grand-landscape scenery, you have to really work to find images. We did actually find “Podunk,” however – it apparently actually exists J Next , some images made in Northern Lower Michigan in an area I have always wanted to explore and photograph. and — sadly — the last chance for foliage imagery for 2014.